Megan Raby. 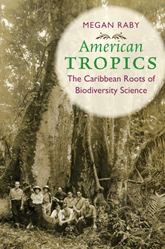 American Tropics: The Caribbean Roots of Biodiversity Science. The University of North Carolina Press, 2017. Biodiversity has been a key concept in international conservation since the 1980s, yet historians have paid little attention to its origins. Uncovering its roots in tropical fieldwork and the southward expansion of U.S. empire at the turn of the twentieth century, Megan Raby details how ecologists took advantage of growing U.S. landholdings in the circum-Caribbean by establishing permanent field stations for long-term, basic tropical research. From these outposts of U.S. science, a growing community of American “tropical biologists” developed both the key scientific concepts and the values embedded in the modern discourse of biodiversity.